Set up an imaginary line across the room. Mark one end 'agree' and the other end 'disagree'. Read out the statements to the pupils and ask them to place themselves on the line in the position which best reflects their view. Now ask them to share the view with their neighbour. Elicit the different views at different points on the line. This task will be revisited at the end of part 2. 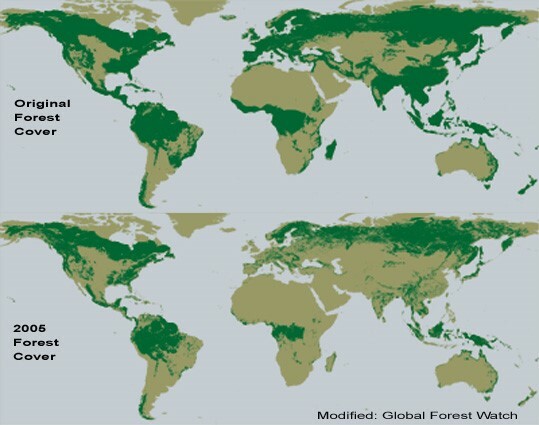 Show the pupils the map of forest coverage past and present and ask pupils what they notice about forest coverage and how it changes over time. Identify Scotland and Africa on the map and discuss what changes have happened in forest coverage in these 2 areas. Groups can share their findings with the class. Discuss with the class the changes in forest coverage with the pupils. What has happened to our Scottish forests over the last 300 years? Is something similar happening to the Congo Basin rainforest? How might these changes affect different groups of people? Do you think these changes might affect things in the long term? Do you think changes in Scotland's forest had similar effects? Scotland has lost most of its forests as they have been cut down and used throughout our history. Forests were used for timber, fuel and cleared for farming. Excessive grazing by sheep and deer contributed to this. Both World Wars contributed to further losses of forest. In the Congo Basin forests are being cleared for farming, timber and have also been affected by war.